We've been moving house. 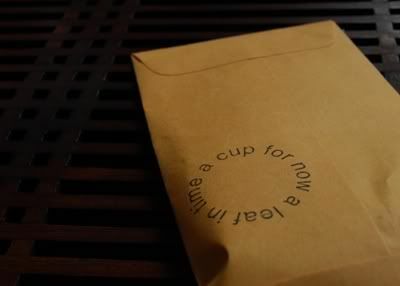 Ware the tea-packing! Veteran readers will recall our move of 2007 - being graduate students, we're nomadic. However, being (nearly) graduated means that this time our move is to more permanent digs. In the current economic climate, we consider ourselves fortunate to have been able to buy a house nearby, and it is reason to be thankful indeed. On the down side, I now have a lawn that needs cutting. 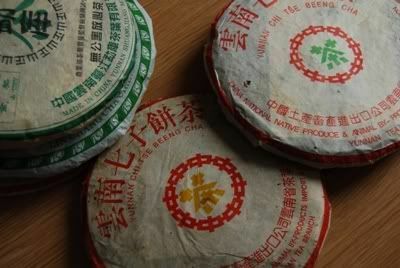 Moving house was a great opportunity to take stock of the state of our tea collection, and I made several pleasant discoveries - including a pair of Changtai cakes that I don't recognise, nor recall ever seeing before. Mystery bingcha! 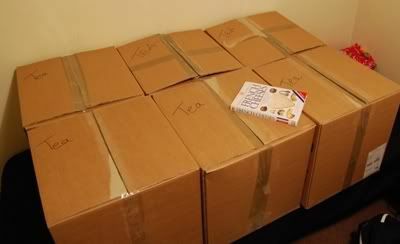 The contents of the box shown above made me smile, as it highlights the effect of the tea community in action. The green-and-white Changtai cake on the left was a gift from Phyll, Dictator of Mars, which remains one of my favourites. The Glenmorangie tube contains some lovely 1990s Red Blossom maocha, courtesy of the board of trustees of the Davelcorp Foundation. 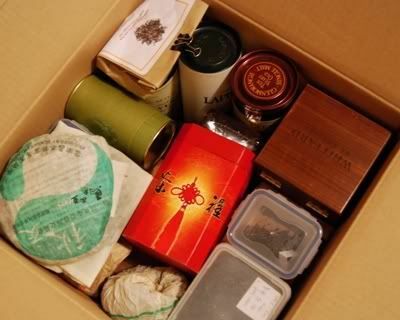 The wooden box contains various sweet maocha from the mighty TA, while the little blue-rimmed plastic container at the bottom contains 1960s Guangyungong from the eternally-generous Nada. 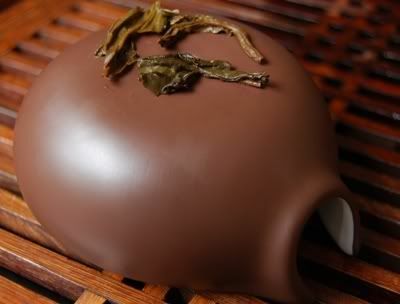 Underneath Phyll's Changtai cake is the little Maison des Trois Thes "Mengkuxue" xiaobing, also from Nada. 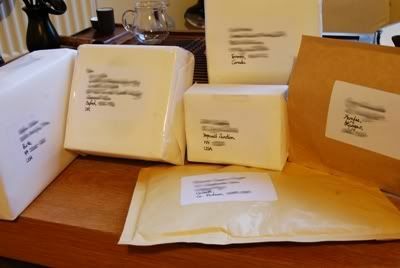 The red box, pictured centre, contains a smooth 14-year shupu from my wife's hometown, while the little shrink-wrapped purple packet above it is some SFTGFOP Nilgiri tea from my Nilgirian friend and colleague SS, brought back from a recent trip home to see his family. 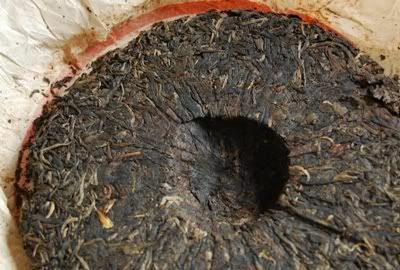 I was thrilled to discover that the Balvenie tube contains a secret supply of my favourite hongcha (Yunnan Sourcing's 2005 "Aged Just Enough" dianhong) from tea-tastrix CB! My dear wife reads the Half-Dipper from time to time, so I had rather hoped she wouldn't see this photograph of exactly how large our tea collection has become. Images added to 2005 Mengku Chengguan "Qingchengfeng". 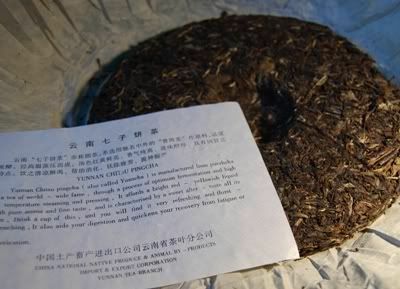 2005 Mingxiang Yayuan - Hailanghao "Motian Yinhao"
This is a cake kindly bought by proxy, by Nada. I didn't see this one on Nadacha, however. You know by now how much I like Hailanghao, it being reliable and fairly priced. This cake is a chubby chappy. "Motian" literally means "reach heaven", but is the word also used for "skyscraper". I do love the poetic nature of Chinese. "I work in a reach-heaven." It sounds almost tolerable. 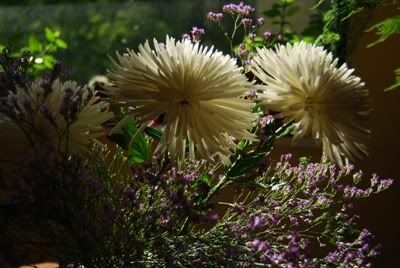 "Yinhao" is "silver fur", referring to the young tip leaves, pictured below. 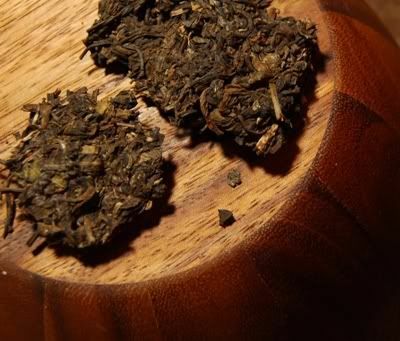 This cake has a sufficient number of dark leaves in its blend to keep me happy - I'm not usually one for enjoying cakes made purely of buds, as they are a touch simplistic for all their creamy flavours. Surprisingly enough, the aroma is complex - I have enjoyed this tea several times over the summer, and it is always the complex aroma of wildflowers that draws me back. 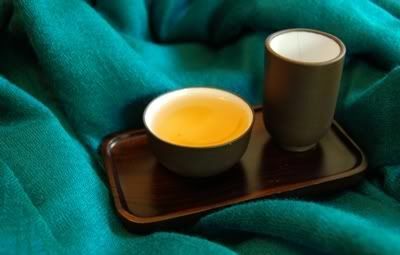 The honest, yellow brew is really very enjoyable - it mixes grassy, "meaty" Biluochun with honey and mushrooms, and wraps it up in a satisfying acidity that its pure-bud cousins lack. 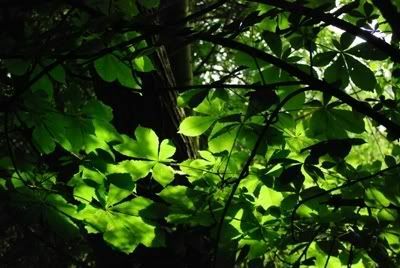 As the sessions wear on, I notice a tendency towards green roughness, which I usually associate with plantation leaves. At this stage, it pays to back off and not push too hard. Thanks to Nada for identifying this friendly, enjoyable tea. 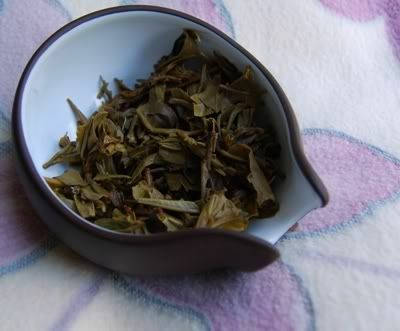 It is one of the few yinhao teas that I have found appealing, primarily due to its blend of darker leaves. 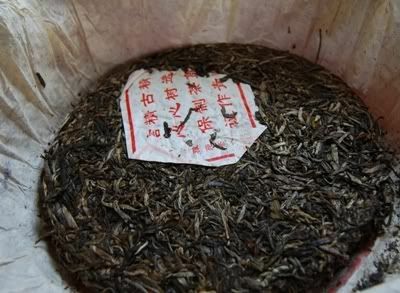 2006 Yongde "Ziyu Shengtai Gushu"
This is sold as "2006 Yongde Organic Mangfei" at Yunnan Sourcing, and I apparently bought this for $18 back in Spring. 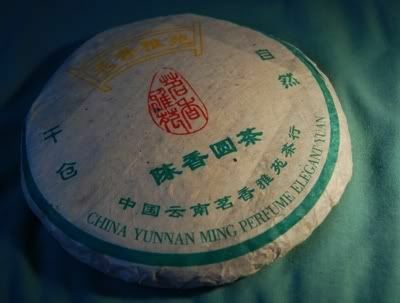 The factory is indeed Yongde, and this is their "Zidu" [purple jade] brand - shown by the pseudo-classical logo at the top of the cake. 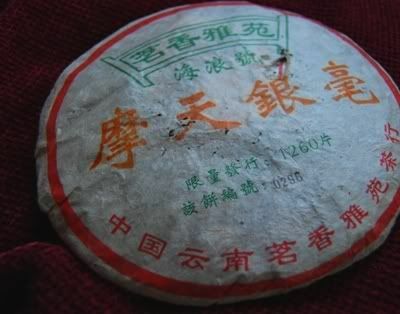 Down the left-hand side of the wrapper, the dreaded "shengtai gushu cha" [ecologically-grown, ancient-tree tea]. Though it sports the ubiquitous ATI organic logo, I remain healthily skeptical given the inexpensive nature of this cake. Though it could feasibly be shengtai, I strongly suspect that the gushu content of this cake is not unadjacent to zero. The rather appalling (apologies!) 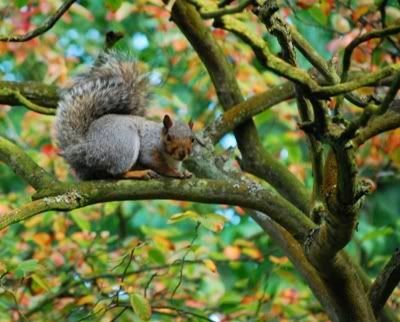 photograph above attempts to show that this is a high-compression bing (but not too high), while the leaves are generally of a decent size. 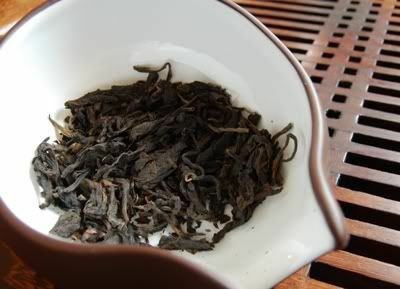 The blend contains both tips and huangpian [thin yellow leaves, often manually removed]. This cake is a bit of an enigma. I get a different tea each time I sit down with it. First time out, I loved it and bought a cake. On revisits, I have been less impressed - certainly thoughts of potentially buying more have been dispelled. I understand that Scott rather likes this one himself. 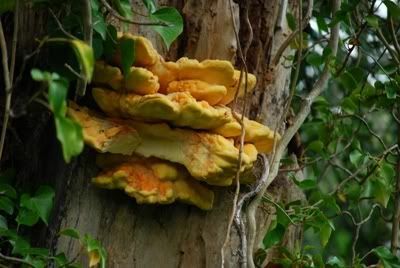 We have sticky fruitiness in both aroma and flavour, delivered in a yellow-orange soup. 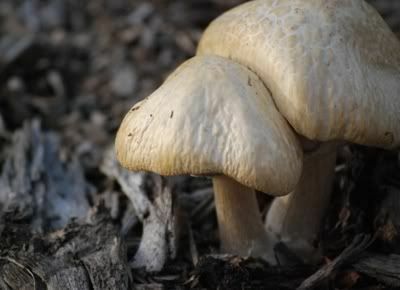 I usually term these "broad and low" characteristics: straw, beaniness, some mushroom. It rings nicely in the throat. 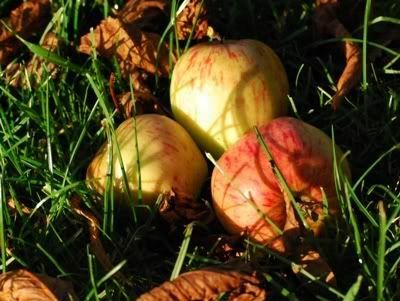 It does have a lot of crisp, clean energy - but it also brews up as rough as a Frenchman's stubble in later infusions, which is surely indication of its mostly-plantation status. I don't recommend this tea - but it's a close call. The fruity aspects are appealing, and it has some decent punch delivered courtesy of some strong acidity in the finish, but it is ultimately simple and a bit rough. I haven't come across any other Yongde Factory products, primarily because there are no samples available for them, and I refuse to consider buying blindly. The lack of samples reminds me a little of when film producers refuse to show a pre-release of their film to critics - I get the impression that the quality of the film is lower than usual, and a pre-sample might adversely affect the number of folk that went to see it in the cinema. 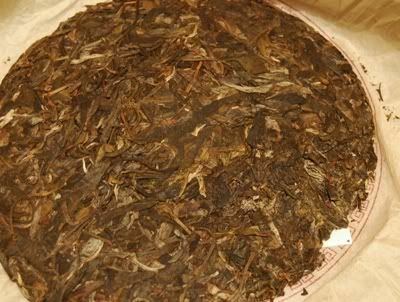 An interesting factoid from the Yunnan Sourcing product description: Yongde County is in Lincang, and is apparently where Xiaguan used to get their leaves. High mountains, tall trees, big sky. I think I'd like it in Yongde. At the same time as buying the 2000 CNNP "Orange Mark" from Malaysian vendor Skip4tea, I took the opportunity to acquire some of its cousin. I have no idea of the formal differences between the green and yellow marks, and so this was quite an education. This is darker and more tightly compressed than its sister, and is much more tippy. It could be that this is simple difference between the two blends. No obvious signs of shicang [wet storage] abound this time, and the brew is a crystal clear orange. Unlike the high Menghai maltiness of its sister, this is low and dark in its sweet aroma. Holy smoke, this tea is soporific. I am almost face down on my tea-tray after two cups. Zonk. 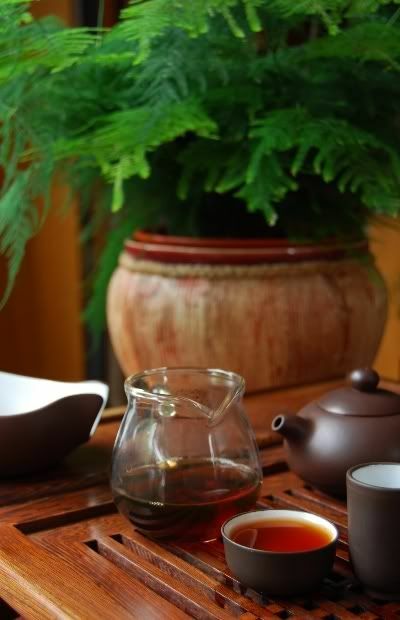 A smooth texture and simple cedarwood flavour make this all about the chaqi, rather than its character in the mouth - though there is a pleasant vanilla ending in the yunxiang [aroma after the swallow]. 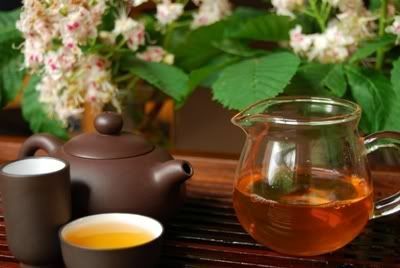 Weak in nature, probably due to its tippiness, I have to bully this tea with long infusions and large quantities of leaves. If you live in any of the following locations, keep an eye out! Just a flying visit with this inexpensive little shupu. 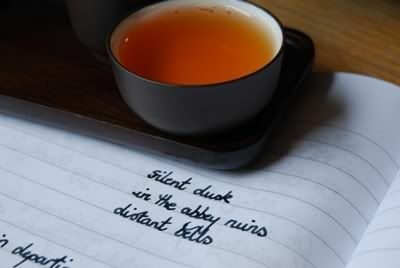 I'm not drinking too many of these teas nowadays, but perhaps I should given their warming effect on cold autumnal days. I think this sample is from RJ, but neglected to make a note on receiving it - danke schone, if so! 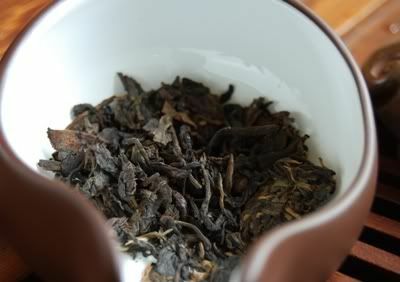 This was a surprisingly active shupu, with a good, thick texture and plenty of sweetness that sits nicely in the throat. 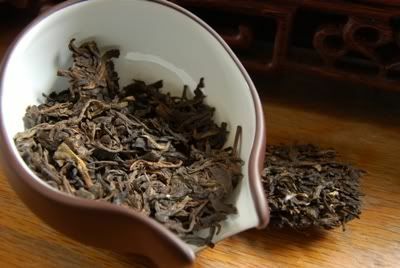 If I were looking for a daily office shupu, this would be a good candidate, being priced at less than $8 at Yunnan Sourcing. I've never heard of the factory or the brand before, and imagine that this is from the recent "new wave" of factories. Veteran readers will be long-accustomed to my endless paeans to the 1998 Menghai "Peacock". It is my north, my south, my east, my west, my working week, and my Sunday best. I've chased it across the globe, occasionally settling for its sisters, but always longing for more of it. 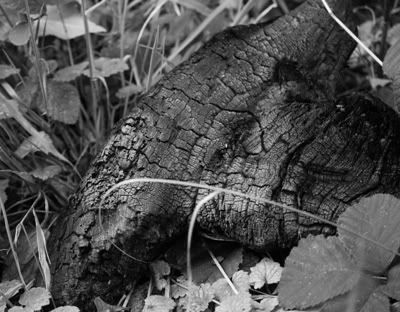 Damp wood. Smooth, damp wood. Brewed into a delightful beverage. You can imagine, then, the immensity of my jubilation on receiving the following envelope from AL. This, a wet-stored version of my beloved 1998 Peacock - all praise to thee, AL! Let all the mountains and oceans proclaim thy awesomeneity. The leaves are turning rusted orange, and "golden flowers" are growing on them. (Enlarge the above photograph by clicking on it, and examine them for yourself.) CB has had these identified by microscope (!) 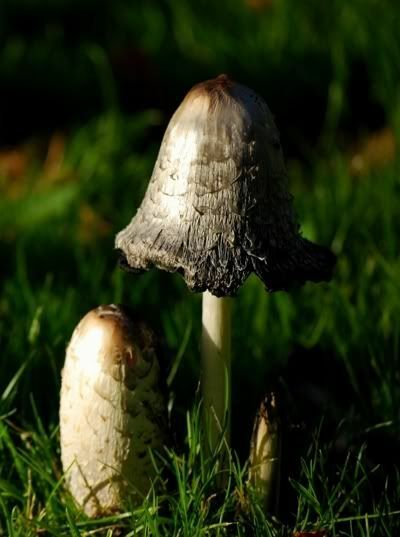 and confirmed that they are crystalline, and not mutant killer spores from Dimension X. This comforts me. Unusually, this tea has very little aroma. The infusions are a classic ruby-red (pictured above) - doesn't that look the very definition of gorgeousness? It is a sultry, pouting classic. Sadly, the character in the mouth is exhausted, tired, and worn thin. 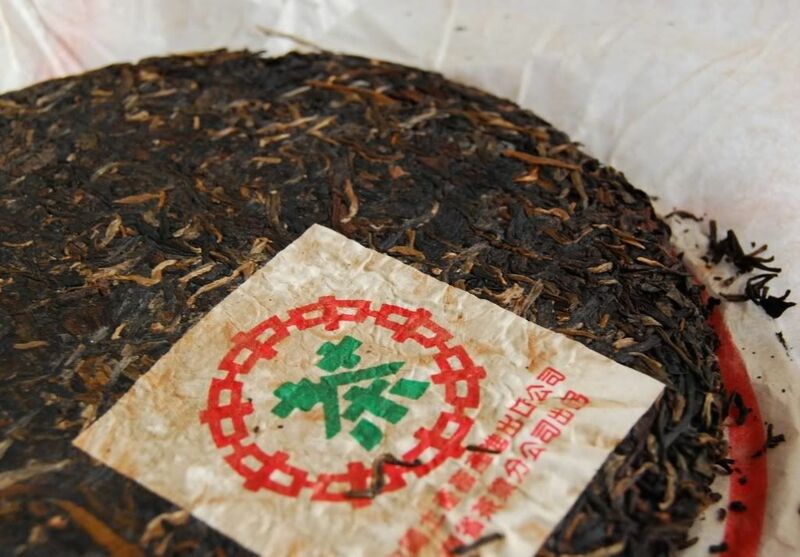 The flavour is super-saturated with shicang (which is pleasant), yet remarkably particulate and granular. Gone is the dazzling damp wood of my old friend. "Hmm, there's not much in it!" says my dear wife, and I cannot disagree. Even so, copious uberthanks to AL for his kindness. A remarkable comparison! 2003 Menghai "Big Green Tree"
Long-time victims of the Half-Dipper may remember my encounters with the 1999 Big Green Tree blue/black label and red label. As always, CB's immensely deluxe generosity has allowed me to enjoy this more modern example of the 1999 benchmarks for gancang [dry storage]. Many thanks, as always. Rusty orange-brown leaves and that tell-tale aroma of sweetness indicate that this is shicang [wet storage], which is fine by me. 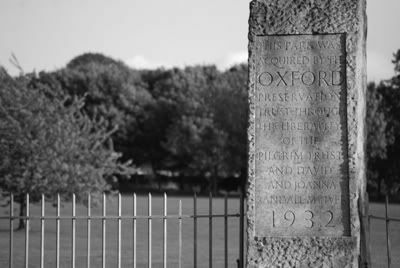 It has a hint of old library, but distant. An old library smelled from several corridors away. 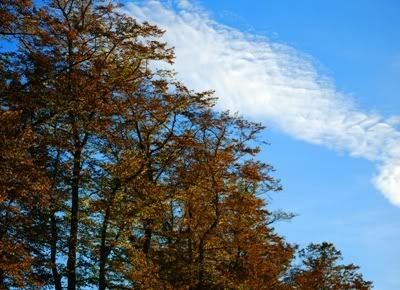 Some decidedly large leaves (pictured above) take me by surprise, being more used to the Menghai spring-time baby leaves. I get excited by the yellow colour of the rinse ("Yellow! From Menghai! 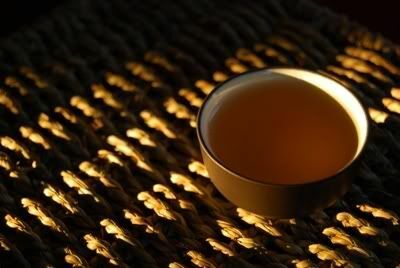 "), but the first infusion turns out to be the expected orange hue. 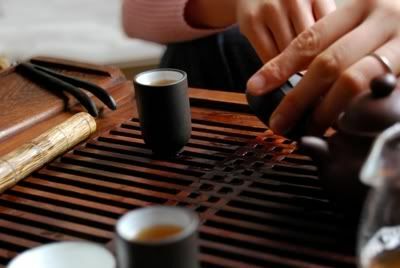 Sticky caramel scents in the wenxiangbei [aroma cup] make this a decidedly pleasant experience. 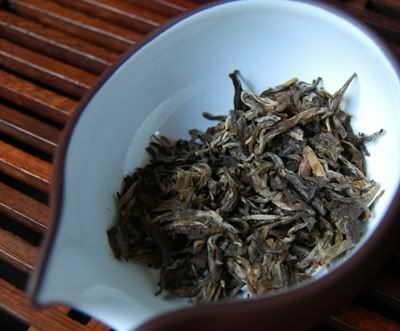 Young, packed with cedar woodiness, with some underlying Menghai malty oxidation, this has plenty of under-the-tongue, mouth-watering sourness that I do enjoy so very much in young shengpu. A little bit of a challenge to lift it out of the ordinary. 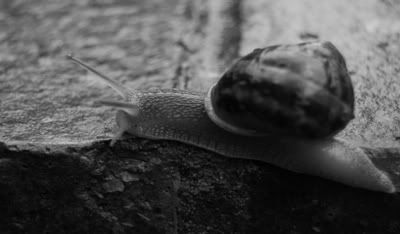 It sprints quickly to a robust huigan [after-sweetness in the throat]. 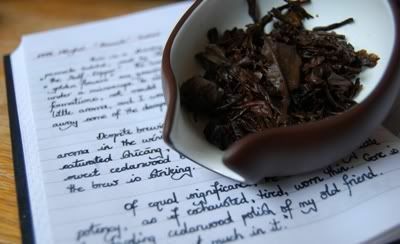 My notes indicate that this is probably the same tea as the 2003 Menghai "Dayi Qiaomu" that we encountered long ago. It certainly feels similar to that description. 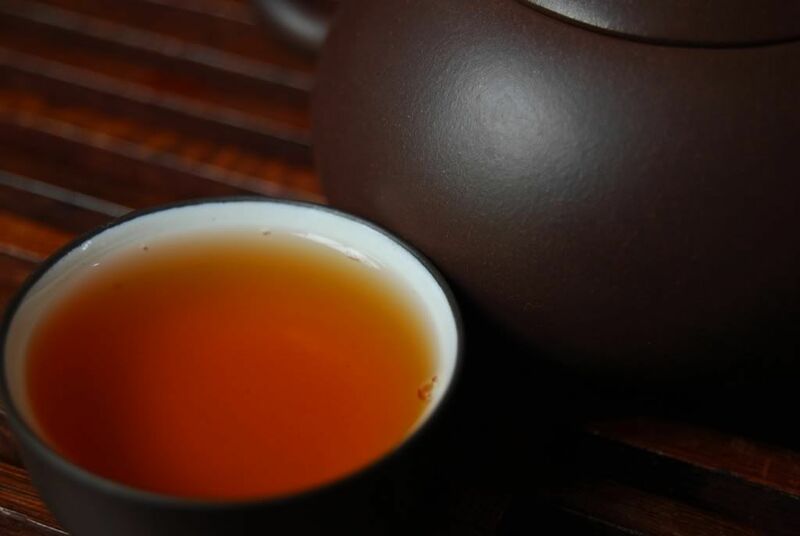 Punchy, vigourous, yet full of library, this is a good tea and I'm very pleased to see Menghai making more challenging cakes - even if it has been Menghai'd. As M. Michel sagely observed a while back, "Sometimes it is fun to be 'had' by Menghai." I met this little fellow in the park, a Songshu [pine rat!]. This 2000 CNNP comes from a Malaysian outfit, Skip4tea, where it cost 63 Malaysian Ringgits. Amazingly enough, this appears to be the only currency against which the British pound has not weakened, and so the cake still costs the 10 pounds for which I bought it in spring. This cake looks old. The wrapper is entirely knackered, and the neipiao [big inner ticket] is darkened and crumbling like an old pirate map. 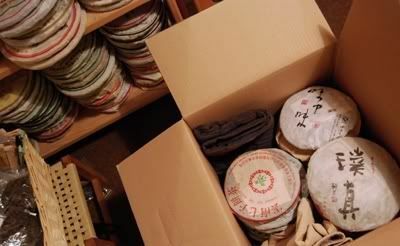 Here there be shicang [wet storage]. The cake is quite ragged around the edges, and looks a lot older than its 8 years. 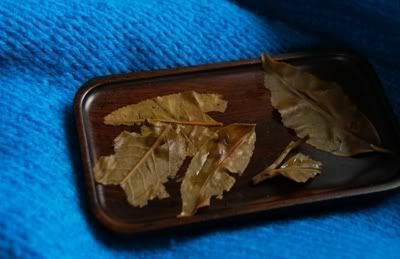 As you can see from the photographs, it is made from small spring leaves, with a modest portion of tips. 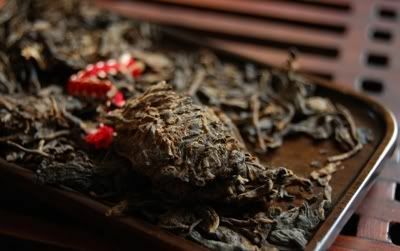 The aroma is gentle, but a trace of shicang is clear. The immense knackerednicity of the wrapper makes it quite difficult to rewrap, and there is a lot of damage to the cake itself. Then again, it has travelled a long way. I remember being similarly knackered and ragged after returning from the East. Clean and crisp - it is fresh and well-done. 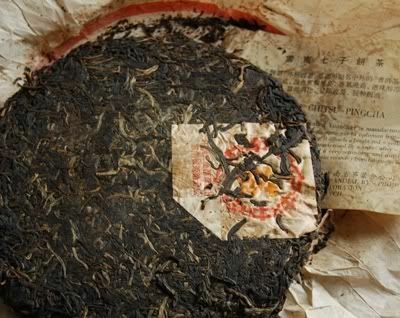 I suspect that it has been in drier storage for recent years, given this crispness and the distant nature of the shicang aroma about the dry leaves. It's a friendly tea, and very hard to overbrew. 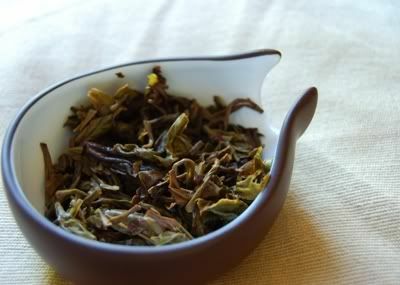 In fact, it's very easy to underbrew and so requires a very strong hand: lots of leaf, longer infusions. 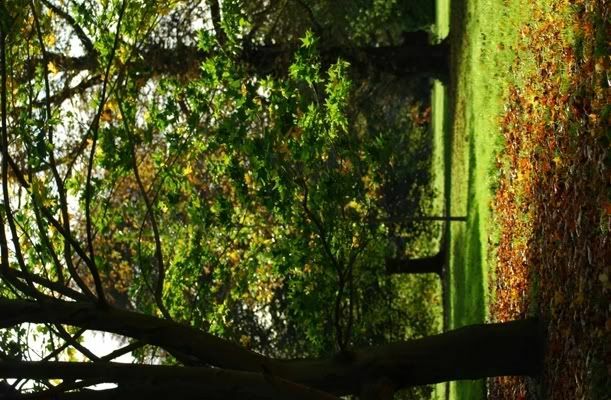 Using lots of leaves makes its energetic nature obvious - but it sedates me incredibly. Even after a long, deep sleep, after three cups of this I am ready to slumber once more. I remember Dr. MA commenting that he found some character of Old Tea about this cake. Though it has some bitterness left, I wonder if aging might just make it a bit tame, as it doesn't seem to have the brutal power or rich content I look for in long-term gambles. Having to brew this tea so hard in order to obtain real character doesn't fill me with hope - but I enjoy this as it is, to drink immediately. 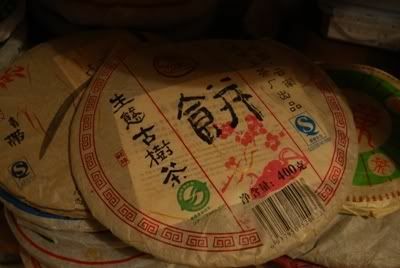 I like shicang, and this is a good example of a cake with only distant dampness - if you don't enjoy shicang too much, this might be a gentle introduction to the genre. "How about you, Jimmy? You an oak man?" Indeed it is, and getting redder every time I visit the nearby park. Hailanghao is nice, too. I'm a Hailanghao man, should such a thing exist. I had to obtain this cake, simply because it was the very first produced by Mr. Hailang. 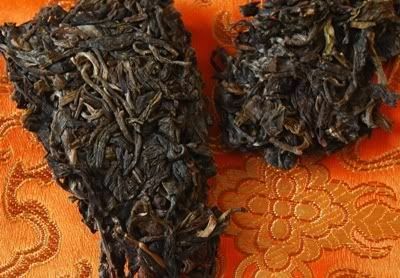 My records show that this cost a minimal £17 from Yunnan Sourcing. The wrapper is beautifully naive, and that sums up the whole cake rather well. Pictured above, even the factory name (Mingxiang Yayuan) has only been half-translated. The neipiao [inner ticket] is a CNNP print. The cake is a charmingly thick, chunky affair, and the same leaves run throughout the pressing. 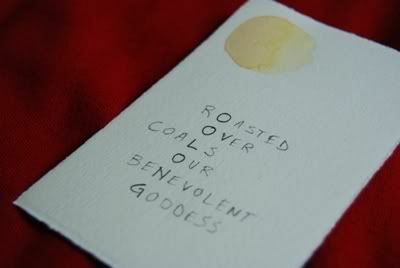 Adorably primitive. It is a far cry from the slick, modern Hailanghao productions - and I love it. 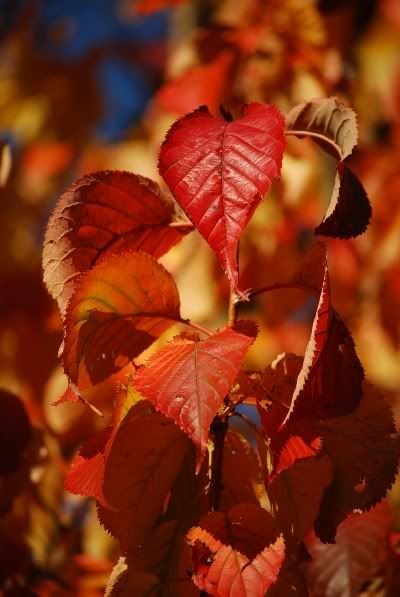 The leaves are tiny (see below), and have a gentle, sweet aroma - though they are tinged towards orange. Given that this is his first cake, I suspect Mr. Hailang has been a touch heavy on the oxidation. Hoho: straight orange brew. 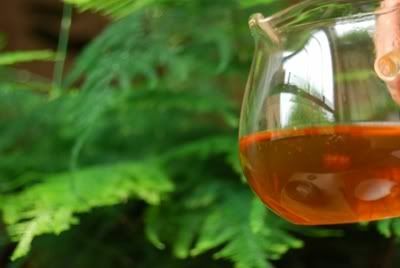 The soup is active and sweet, if tweaked gratuitously, and it presents a fine cedarwood character that warms my chilly autumnal bones. "I like it, it's decent - perhaps I am biased towards this kind of tea", sayeth my dear wife. It is clean, and manages some decent complexity despite its processing, with a hint of autumnal flowers - perhaps it's a little like Oriental Beauty in that regard. 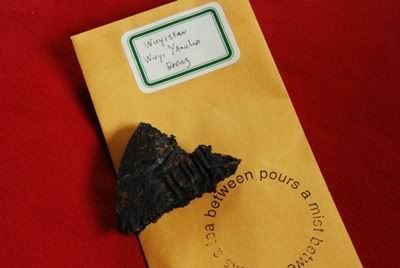 These young orange shengpu are very easy to brew, being very forgiving. 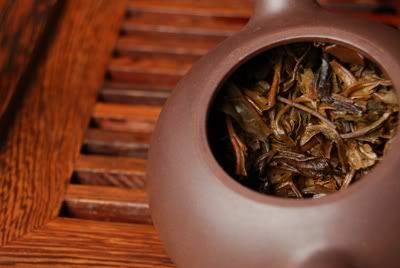 While they might not reach the heights of other teas, a good tea in this genre can be a warm treat. 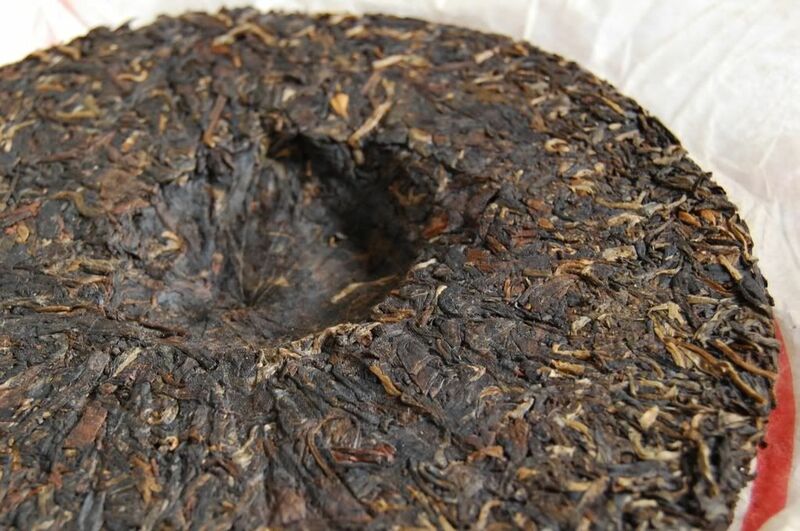 I applaud Scott of Yunnan Sourcing for keeping the price realistic on this cake - being the first of its kind, and six years old, it could easily have been priced much higher. Its lack of complexity and simple, cedarwood nature prohibit paying any more for this, and it is refreshing to see a vendor credit his customers in such a way. Warming and comforting on a Sunday morning filled with "mists and mellow fruitfulness", I sit back with a later infusion and listen to my wife speaking hometown dialect with her mother via Skype. 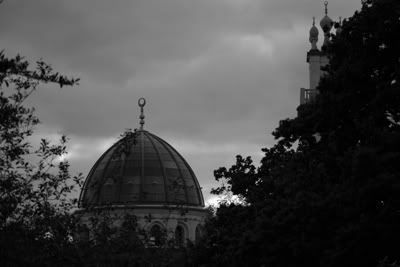 The shadow of impending Michaelmas term looms over everything, like the big flying saucers lurking over the White House in Independence Day. In true Gothic fashion, a storm batters the windows. These are dark days. In celebration* following a recent interview for a teaching position, I return to a novel treat kindly provided by AL: a yancha bing. *It seems that when a man reaches a certain age, he feels no jubilation at good news, merely relief. AL, creator of the delightful Seven Tea Moons (one shown above) has kindly provided a good-sized sample of a perfectly circular bing. As pictured below, the sample comes from the edge of the cake, which appears to have uniform thickness and a crisp circular circumference - this bing could teach Xiaguan a thing or two about compression! The leaves have a macabre Gieger-esque slickness about them, fitting the Gothic mood rather well. The sample looks like part of a hideous relic recovered from an alien world or a Lovecraftian fantasy. Happily, the brew doesn't taste extra-terrestrial. In fact, it's a rather rich raisin-like affair. Very clean and smooth, it is a welcome tonic to the End of Days which appears to be taking place outside the window. I don't encounter a great deal of yancha, though not by design. This was a welcome foray into a part of the teasphere that I don't habitually visit - thanks again, AL. If the eldritch horrors from unimagineable aeons past drink teas like this, I could learn to Cthulhu fhtagn with the best of them.